Beneath the deceptively placid surface of everyday life, the British population is engaged in a momentous encounter with Islam. Three developments of the past week, each of them culminating years' long trends – and not just some odd occurrence – exemplify changes now underway. Home Secretary Jacqui Smith describes terrorism as "anti-Islamic." First, the UK government has decided that terrorism by Muslims in the name of Islam is actually unrelated to Islam, or is even anti-Islamic. This notion took root in 2006 when the Foreign Office, afraid that the term "war on terror" would inflame British Muslims, sought language that upholds "shared values as a means to counter terrorists." By early 2007, the European Union issued a classified handbook that banned jihad, Islamic, and fundamentalist in reference to terrorism, offering instead some "non-offensive" phrases. Last summer, Prime Minister Gordon Brown prohibited his ministers from using the word Muslim in connection with terrorism. 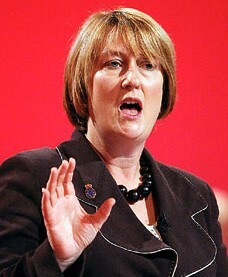 In January, Home Secretary Jacqui Smith went further, actually describing terrorism as "anti-Islamic." And last week the Home Office completed the obfuscation by issuing a counter-terrorism phrasebook that instructs civil servants to refer only to violent extremism and criminal murderers, not Islamist extremism and jihadi-fundamentalists. Second, and again culminating several years of evolution, the British government now recognizes polygamous marriages. It changed the rules in the "Tax Credits (Polygamous Marriages) Regulations 2003": previously, only one wife could inherit assets tax-free from a deceased husband; this legislation permits multiple wives to inherit tax-free, so long as the marriage had been contracted where polygamy is legal, as in Nigeria, Pakistan, or India. In a related matter, the Department for Work and Pensions began issuing extra payments to harems for such benefits as jobseeker allowances, housing subventions, and council tax relief. Last week came news that, after a year-long review, four government departments (Work and Pensions, Treasury, Revenue and Customs, Home Office) concluded that formal recognition of polygamy is "the best possible" option for Her Majesty's Government. Third, the archbishop of Canterbury, Rowan Williams, endorsed applying portions of the Islamic law (the Shari'a) in Great Britain. Adopting its civil elements, he explained, "seems unavoidable" because not all British Muslims relate to the existing legal system and applying the Shari'a would help with their social cohesion. When Muslims can go to an Islamic civil court, they need not face "the stark alternatives of cultural loyalty or state loyalty." Continuing to insist on the "legal monopoly" of British common law rather than permit Shari'a, Williams warned, would bring on "a bit of a danger" for the country. Archbishop of Canterbury Rowan Williams says that Islamic law in Great Britain "seems unavoidable." Prime Minister Brown immediately slammed Williams' suggestion: Shari'a law, his office declared, "cannot be used as a justification for committing breaches of English law, nor can the principle of Shari'a law be used in a civilian court. … the Prime Minister believes British law should apply in this country, based on British values." Criticism of Williams came additionally from all sides of the political spectrum – from Sayeeda Warsi, the Tory (Muslim) shadow minister for community cohesion and social action; Nick Clegg, leader of the Liberal Democrats; and Gerald Batten of the United Kingdom Independence Party. Secular and Christian groups opposed Williams. So did Trevor Phillips, head of the equality commission. The Anglican church in Australia denounced his proposal, along with leading members of his own church, including his predecessor, Lord Carey. Melanie Phillips called his argument "quite extraordinarily muddled, absurd and wrong." 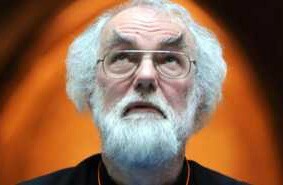 The Sun newspaper editorialized that "It's easy to dismiss Archbishop of Canterbury Rowan Williams as a silly old goat. In fact he's a dangerous threat to our nation." It concluded acerbically that "The Archbishop of Canterbury is in the wrong church." Although widely denounced (and in danger of losing his job), Williams may be right about the Shari'a being unavoidable, for it is already getting entrenched in the West. A Dutch justice minister announced that "if two-thirds of the Dutch population should want to introduce the Shari'a tomorrow, then the possibility should exist." A German judge referred to the Koran in a routine divorce case. A parallel Somali gar courts system already exists in Britain. These developments suggest that British appeasement concerning the war on terror, the nature of the family, and the rule of law are part of a larger pattern. Even more than the security threat posed by Islamist violence, these trends are challenging and perhaps will change the very nature of Western life. Feb. 13, 2008 update: For more on the second of the three topics discussed here, see my weblog entry, "Harems Accepted in the West." In particular, note the Ontario Family Law Act, which paralles UK law. For the context of the archbishop's statement, see my blog, "Accept Shari'a in the West?" And for a bit of background on Rowan Williams, see my blog, "Archbishop of Canterbury: Al-Qaeda Moral, Bush Immoral." 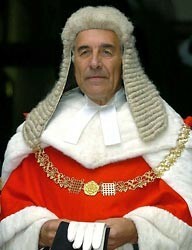 Lord Phillips of Worth Matravers, the lord chief justice, endorsed Shari'a for Great Britain. In a speech at the East London Muslim Centre, Lord Phillips said it was "not very radical" for Dr Williams to argue that sharia can be used to help govern issues like family disputes and the sale of financial products. Lord Phillips said: "It is possible in this country for those who are entering into a contractual agreement to agree that the agreement shall be governed by law other than English law." Therefore, he said, he could see no reason why sharia should not be used to settle disputes in this country. He said: "There is no reason why principles of sharia, or any other religious code, should not be the basis for mediation or other forms of alternative dispute resolution." He added: "It must be recognised however that any sanctions for a failure to comply with the agreed terms of the mediation would be drawn from the laws of England and Wales." Sharia suffered from "widespread misunderstanding" in Britain, Lord Phillips said. "Part of the misconception about sharia is the belief that sharia is only about mandating sanctions such as flogging, stoning, the cutting off of hands or death for those fail to comply with the law," he said. "In some countries the courts interpret sharia as calling for severe physical punishment. There can be no question of such courts sitting in this country, or such sanctions being applied here." Related Topics: Dhimmitude, Islamic law (Shari'a), Muslims in the United Kingdom | Daniel Pipes receive the latest by email: subscribe to the free mef mailing list This text may be reposted or forwarded so long as it is presented as an integral whole with complete and accurate information provided about its author, date, place of publication, and original URL.